Doug likes ice cream. But which brand? So you think you know the Philadelphia Eagles, and what they did during their historic 2017 season? Let's see it. Below are 20 obscure Eagles trivia questions from the 2017 season. If can get even half of these without cheating, you either have way too much time on your hands, or you should be an Eagles beat writer. Or both. 1) On the play in which Carson Wentz was injured, he was sandwiched in between two Rams players. Name one of them. 2) On the Eagles’ second attempt at the Electric Slide against the Bears, which Eagles player pretended to film it? 4) Before Jake Elliott made a 61-yard field goal to beat the Giants, Wentz remarked to a teammate, “I’ll give him my game check if he makes it.” Which teammate did Wentz say this to? 5) In his iconic speech at the Super Bowl parade, Jason Kelce said that three teammates “Can’t catch!” Who were they? 6) What was the Eagles’ preseason record in 2017, and who did they beat? 7) On his pick six against the Vikings, Patrick Robinson got a key block from a teammate. Or perhaps more accurately stated, one of Robinson’s teammates got bulldozed by a Vikings player while trying to throw a block, but still helped Robinson get into the end zone. Who was the Eagles player who got bulldozed, and who was the Vikings player who bulldozed him? 8) In what place did Wentz finish in MVP voting, and who beat him? 9) The Eagles traded away five players in 2017. Name them. 10) Two Eagles reserves in 2017 were former top 10 picks in the draft. Name them. 11) Which Falcons player should have had an easy interception of Nick Foles in the playoffs, but the ball bounced off his knee and into the hands of Torrey Smith? 12) Before the Eagles got hot in the second half and manhandled the Cowboys Week 11, they trailed at halftime. What was the halftime score? 13) How many teams did the Eagles beat by at least three touchdowns? 14) There were three games in which Eagles defensive linemen scored touchdowns in the last two minutes of the game. Name the games in which that occurred, and who scored the touchdowns. 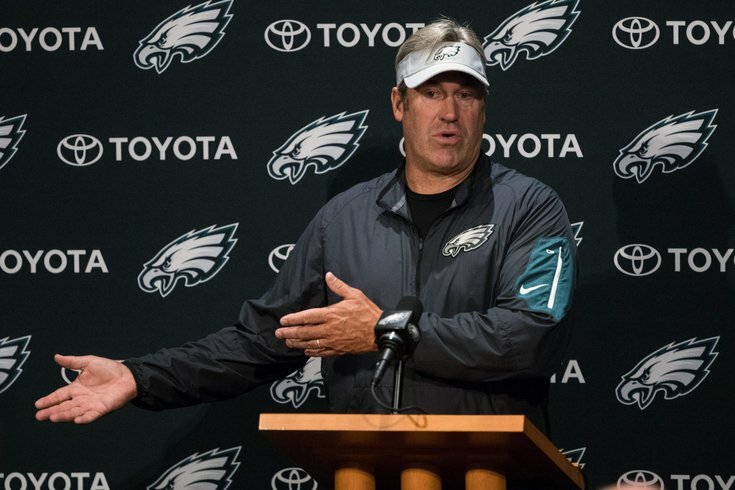 15) What is Doug Pederson's favorite brand of ice cream? 16) After Tom Brady dropped the pass in the Super Bowl, what did Malcolm Jenkins do/say to him? 17) If you add up the jersey numbers of all the players who touched the ball during the "Philly Special," what do you get? 18) What Patriots offensive lineman did Brandon Graham beat before his strip sack of Brady? 19) What was the Eagles' point differential in the playoffs? 20) Did the Eagles win the Super Bowl last season?